The report "Amines Market by Amine Type (Ethylene, Alkyl, Fatty, Specialty, & Ethanol), & by Application (Agricultural Chemicals, Personal Care, Cleaning Products, Petroleum, Water Treatment, Pharmaceutical, Textile, & Others) - Global Trends and Forecast to 2020", The market size of amines is estimated to grow from USD 13.35 Billion in 2015 to USD 19.90 Billion by 2020, at an estimated CAGR of 8.3% between 2015 and 2020. Amines are used as a chelating agent, intermediate, formulator, neutralizing agent, activator, and corrosion inhibitors in various end-use applications such as agricultural chemicals, cleaning products, gas treatment, personal care products, petroleum, water treatment, paint & coatings, pharmaceuticals, textile chemicals, and wood treatment. Growth in end-use industries such as personal care, agriculture, water treatment, and petroleum is the driving the demand for amines. Among all regions included in the report, Asia-Pacific and RoW are estimated to witness a high growth in the next five years. Also, the demand across these regions is reinforced by the emerging markets, namely, China, Brazil, and India. The personal care product industry comprise more than 1,000 different companies considering global as well as regional presence. Johnson & Johnson, Revlon, Estee Lauder, Alberto-Culver, LOreal, Parlux Fragrances, Avon, Colgate-Palmolive, Proctor & Gamble, and Kimberly-Clark, are some of the recognized players in the industry. Personal care products, mainly hand lotions, cosmetic creams, cleansing creams, shaving creams, and shampoos are witnessing strong demand in recent years, due to growing population and their health awareness globally. Amines are used as stabilizers, chemical intermediates, and neutralizers in personal care application. Hence, the rising personal care industry is indirectly aiding the amines demand. In 2015, Asia-Pacific accounted for the largest market share and is expected to to register the highest CAGR between 2015 and 2020. The robust demand in Asia-Pacific is the major driving factor for the amines market. China registered the highest demand for amines due to increased consumption of across end-user industries in the last 2-3 years. It is also the largest market for amines at a global level. Emerging economies such as Brazil, India, Mexico, and others are projected to have a bright future in this market. The key players in the amines market are AkzoNobel NV (The Netherlands), BASF SE (Germany), The Dow Chemical Company (U.S.), Huntsman Corporation (U.S.), Clariant AG (Switzerland), Taminco (Belgium), Tosoh Corporation (Japan), Mitsbishi Gas Chemical Company (Japan), Oxea Gmbh (Germany), Delamine (The Netherlands), and others. 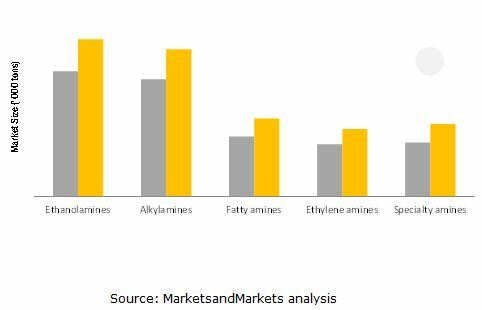 The scope of the report includes detailed information regarding major factors influencing the growth in the amines market such as drivers, restraints, challenges, and opportunities. A detailed analysis of the key industry players has been done to provide insights into their business overview, products and services, strategies, new product launches, mergers & acquisitions, partnerships, agreements, collaborations, and recent developments associated with the market.